Cord, CD-318. 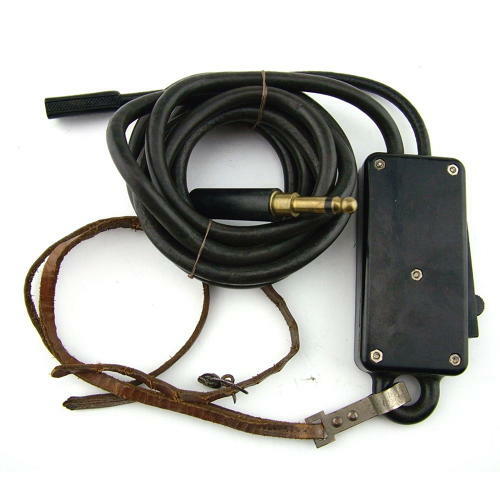 Extension cord used with the T-30 throatmicrophone and microphones equipped with a PL-291 plug to radio transmitters. The microphone plug was inserted into the jack of the extenstion cord (JK-48). The cord has an inline 'push to talk' switch, SW141-V, and a black PL-68 jackplug for connecting with the aircraft intercom. An adjustable leather strap was used to hang the extension cable around the airman's neck. Shows use and wear at the point and the leather strap is broken, otherwise in good used condition. Stock code H22242.